Please join us Thursday May 26th from 6:30pm – 8:30pm for a reception, lecture, and discussion with KAROLYN SCHMIDBAUR of COOP HIMMELB(L)AU as she shares his research, work, and urban strategies in collaboration with the Cal Poly LA Metro Program in Architecture and Urban Design. This event is FREE and open to the public. Parking is available at Valet on the corner of Helms Ave. and Venice Boulevard. 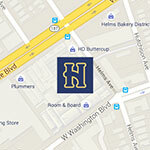 Head down Helms Avenue toward Washington Boulevard, turn right to the Helms Design Center located at 8745 Washington Boulevard. Please rsvp to calpolylametro@gmail.com. Karolin Schmidbaur studied Architecture at the Technical University of Munich and received her Diploma in 1992. Since 1992 she has been practicing Architecture internationally with COOP HIMMELB(L)AU in their offices in Vienna, Austria, Guadalajara, México, and Los Angeles, California. Since 1993 she has been based in Los Angeles, California. She is a Licensed Architect in Germany since 1995. In 1996 she was made a Partner of COOP HIMMELB(L)AU. Currently Karolin Schmidbaur is Design and Managing Partner of COOP HIMMELB(L)AU Vienna and also the Director of COOP HIMMELB(L)AU’s Los Angeles, California office. Completed projects at COOP HIMMELB(L)AU under her lead include the Groningen Museum East Pavilion, the Netherlands, completed in 1994, and the Central Los Angeles Area High School #9 for visual and performing arts in downtown Los Angeles, California, completed in 2008. Since 2009 Karolin Schmidbaur is co-responsible for the design portfolio at COOP HIMMELB(L)AU and in charge of the office’s urban research projects. Karolin Schmidbaur has taught design studio at the University of Southern California (1997-1998) and the Southern California Institute of Architecture (SCI-Arc) from 1998 to 1999 as well as 2014. From 2010 – 2012 she has taught at the Urban Strategies Program at the University of Applied Arts in Vienna.